Even today, water is often transported in metallic pipes or systems. Here, the simpler the iron, the greater the risk of corrosion. Corrosion or rust occurs when the metal of the pipe reacts with the oxygen in the water. Pipelines with stagnant or low-mineral water are more likely to be affected by damage due to corrosion. Standing water emits oxygen, or in other words, releases oxygen. This reacts with the iron pipe wall and causes corrosion. Corrosion harms the surface and can erode the substance. In the case of metal, it is visible in form of rust. The metal of the pipes reacts with the oxygen in the water. Pipes in which the water is stagnating are even more endangered to be affected. An indication of corrosion in the water pipe is brown coloring or turbidity in drinking water. This is because material/rust is removed by a chemical reaction/corrosion. In other words, the corrosion attacks the iron in the pipe, resulting in rust. In the case of a circuit, the rust concentrates at places where there is less flow. Under certain unfavorable conditions, the rust eats into the metal. This phenomenon is called pitting. Mining companies say, that 70 % of the freshly mined iron ore, is used to replace corroded steel. Steel used in the construction, used for pipelines, used for machines and whole plants. See as an example the picture to the left of an old plant, where the rust covers the metal from outside. 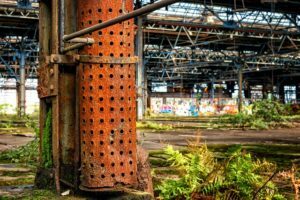 It is estimated by NACE, the US American National Agency of Corrosion Engineers, the damage in the US is $300 Billion annually. Corrosion is seen mostly outside, where unprotected metallic surfaces are in contact with the atmosphere. Here our water treatment can't help as it only works where the surface is in contact with the water flowing in the pipe. Merus Rings are made for corrosion control inside pipes and machines. Corrosion damages in pipes can be very costly in industrial applications, as well as in private homes. Changing pipes or machines involves high costs and downtimes. It can also be relevant for process safety, if safety valves, sprinklers and other devices get immovable due to rust. 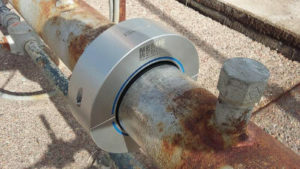 We provide a technical solution to reduce existing corrosion in the pipe. On the long term, the corrosion rate decreases and the pipe is protected against damage. The Merus Technology is based on a physical phenomenon using oscillations to affect the water and its ingredients. Depending on the size of the system we install one or several Merus Rings to reach every corner where water flows. They immediately have an effect on the fluid in the pipe. In the case of corrosion, existing corrosive particles are cleaned from the surface with the flow. If it is possible for you to monitor the water's color, you will now notice, there are more brown particles in it for some minutes of flow. The surface is now clean and the water will get clear again. What now happens brings the biggest benefit. The water is able to hold more of its oxygen. Therefore, it doesn't "settle" at the pipe surface and the oxidation process is disturbed. This description explains in a technical way, what happens in the pipe. The chemical explanation is more complex and is briefly illustrated here. As the water itself is not changed chemically, this approach of water treatment is called "physical water treatment". We think that physical water treatment is the ideal solution to prevent pipes and machines from corroding. Without adding chemicals or needing service effort, the Merus Technology brings not only economical but also ecological benefit. Please see on our webpage what a Merus Ring can do to avoid rust damage or bring down corrosion rates MPY significant. The case studies give an overview of methods and possibilities. If you have further questions concerning your individual case please don't hesitate to contact us.